We’re having an ice storm in Atlanta. Sounds strange, here in the usually balmy American South, but not all that unusual. Ice shuts down the city every ten winters or so, starting as cold rain that freezes when it hits anything below 32 degrees: bridges, overpasses, stone stairways, iron gates and rails, roofs, tree limbs, power lines. Eventually everything is covered in ice, looking very pretty but making for dangerous driving or even walking, as the ground is a skating rink and those ice-laden trees and power lines give way under the burden and come crashing down like shattered glass. There was an ice storm in the winter of 1872, John Henry Holliday’s last year in Georgia before making his getaway to the Wild West. It came just before Christmas, taking down the telegraph wires and laying pine trees over the railroad tracks, and cutting off travel and communication. And it was in that December ice storm that Doc’s uncle, his cousin Mattie’s father, Captain Robert Kennedy Holliday, passed away of what was likely pneumonia. He died on Christmas Eve with his grieving family and the parish priest gathered near, and was buried ten miles away in the Fayetteville Cemetery where his wife’s Catholic kin had a cemetery plot. Doc himself was probably at that funeral, making the trip south from Atlanta where he was living at the time with other family members. He may have even been with Uncle Rob when he passed, as the family remembers his visits to his cousins in Jonesboro. So Doc Holliday was no stranger to bad weather, and wouldn’t have paid much attention in October of 1881 when the air in Tombstone took a chill. He just bundled up in his grey overcoat and went about his day, until the Clantons and the McLaurys caused a fuss in town that ended with the gunfight at the OK Corral. That overcoat became a crucial piece of evidence at the month-long hearing that following the shootings, as witnesses remembered seeing him tuck a shotgun under the coat on the iconic walk down Allen Street. It was Virgil Earp’s shotgun, traded for Doc’s cane, as the sight of Marshal Virgil carrying a shotgun might have made the cowboys even more jumpy. And it was Virgil’s shotgun that Doc used to blast a hole through Frank McLaury. But it was the weather in Colorado that hurried his own death, as he sought treatment in the mountains for the consumption that ravaged his lungs and finally the rest of him as well. The Rockies were full of mineral springs that promised miracle cures: Steamboat Springs, Colorado Springs, Manitou Springs, and the famous baths at the Wagon Wheel Gap resort. In that winter of 1886-1887, however, the baths were the only warm thing in those mountains, as Colorado, like the rest of the country, suffered from the coldest weather on record – especially dangerous for a man battling a deadly disease. The historically low temperatures were the aftermath of the cataclysmic eruption of Mount Krakatoa in Indonesia in 1883. The explosion was heard 3,000 miles away, with recorded shockwaves reaching around the globe seven times. The plumes of ash and sulfuric acid shot 50 miles into the atmosphere, obscuring the sun, and the sudden darkness dropped temperatures worldwide. The “Volcanic Winter” lasted for five years, with summer snowfalls in North America and blizzards in South America. On the Great Plains, thousands of head of cattle froze to death, decimating entire herds and hastening the end of the big cattle drives. The last winter of Doc’s life was also the coldest, especially in the snowy mountains of Colorado. (The Krakatoa eruption created flaming red sunsets in the Northern Hemisphere, and inspired artist Eduard Munch’s famous painting “The Scream” – he said the sound of the eruption felt like the earth groaning). 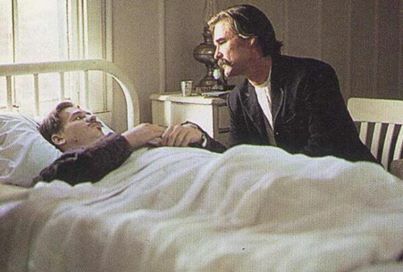 Actor Val Kilmer likely didn’t know about the connection between Krakatoa and Doc’s last cold days in Colorado when he requested a bed of ice for his last scene in the movie, “Tombstone.” What he wanted was something to make him shiver and feel “weird,” and the trick worked. In a film filled with accurate depictions of clothing and firearms and entertainments, they got the temperature right, as well.